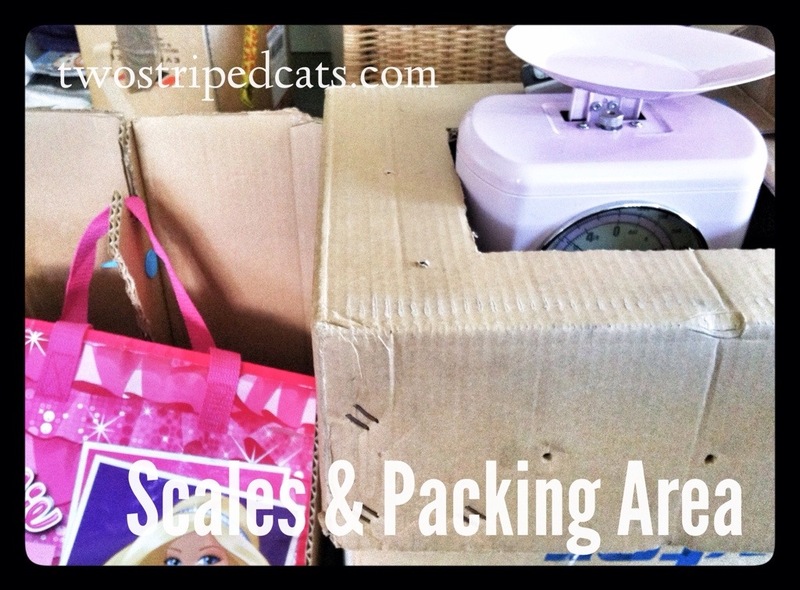 Cardboard boxes are incredibly useful for their intended purpose of storage and transport of goods. And they can be reused in this way over and over again. Plus they are completely recyclable and biodegradable (minus any sticky tape). 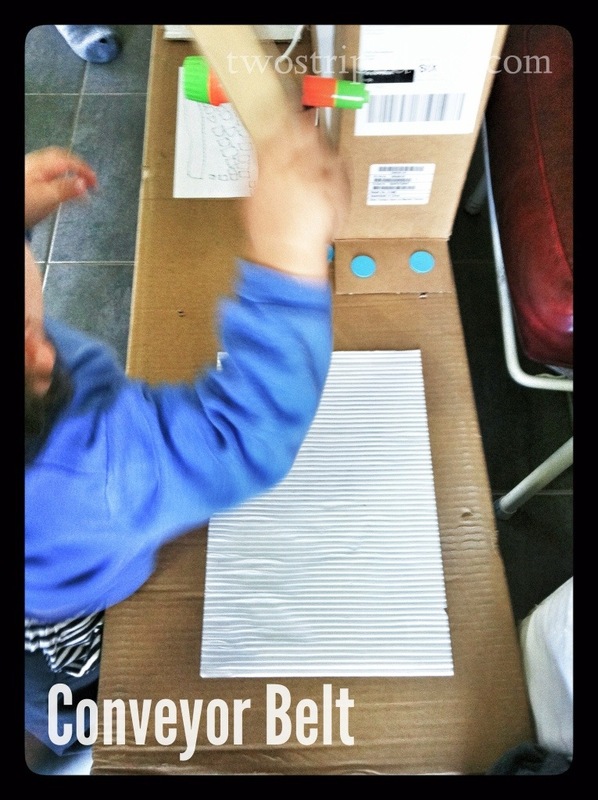 We love cardboard boxes in our household as they are a wonderful resource for kids play. There is always a supply on hand ready for a rainy day! 1. If you haven’t visited my Makedo Creations page yet, then go on, take a peak. I hope you’ll be inspired by what my husband and daughter have made with boxes and other recyclables and trash. 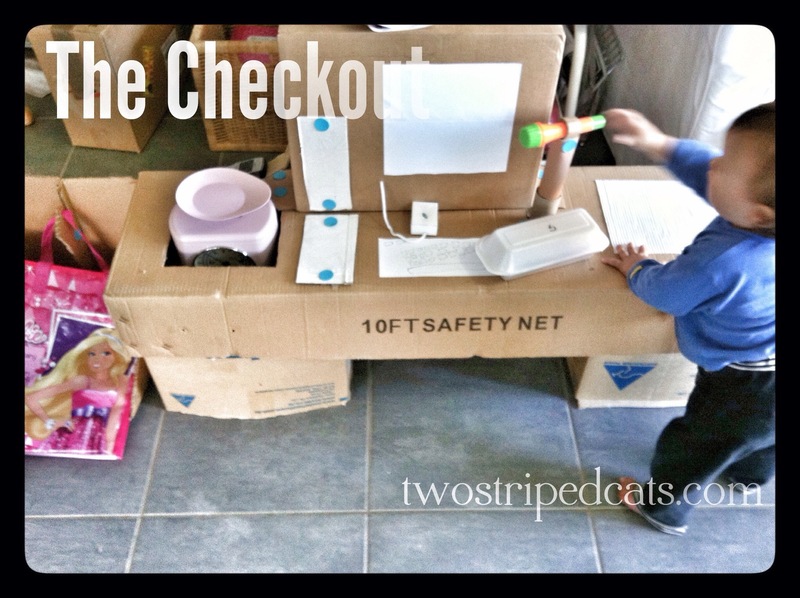 Here is their latest creation…a checkout. Complete with conveyor belt, scanner, monitor, scales, eftpos machine and packing area it’s been a popular play area for the children for the past couple of weeks. It uses only boxes and Makedo connectors plus an old mobile phone (eftpos machine) and real scales. 2. Use to suppress or kill weeds and grasses under a thick layer of mulch. Overlap pieces of opened out cardboard box on the area to be mulched, wet down then apply mulch. This is also a great way to smother grasses when building a no-dig garden bed or other raised garden beds onto a patch of lawn. 3. When wrapping odd-shaped gifts place the items in a box then wrap (reuse wrapping paper and other papers, fabric, etc). It will be much easier and neater. 4. Make an office in-box by cutting off one large side and the top. Cut the end of the narrow sides on an angle. Cover in decorative or interesting paper or fabric. 5. 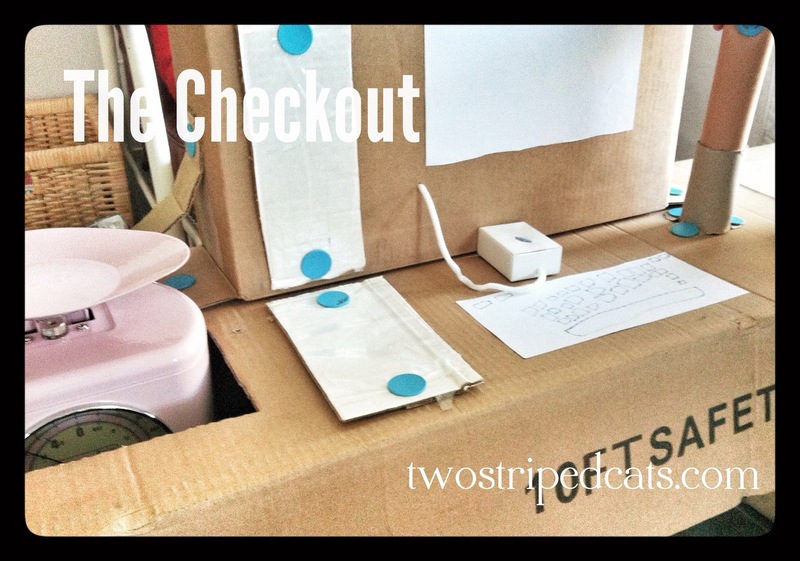 Make a magazine holder with a sturdy cereal box. 6. Place strategically under furniture when rearranging it, to protect the floor and make it easier to slide. 7. Entertain your pooch. Fill smaller boxes such as cereal boxes with dry dog food or treats, close then give to your dog to rip apart. This is a fabulous way to feed an active or young dog who needs lots of stimulation. Rather than gobbling up the food in a flash, your dog will spend extra time extracting the food and tearing up the box. The pieces of torn cardboard can later be placed on the compost. 8. Make a sled for snow or a grassy slope. 9. Protect fingers when hammering a nail. Push the nail through one end of a rectangular-ish piece of cardboard and hold onto the other end once you commence hammering. Remove cardboard then complete the hammering if necessary. 10. When transporting furniture and household items in a vehicle or trailer, use pieces of cardboard box placed flat against the items to protect against damage from rubbing and to help hold them in place. Use small pieces under ropes, again to stop rubbing but also to help secure the items when the rope is tightened. My children love cardboard boxes. We once had a massive car seat box in our living room for a couple of months as the girls played in it…they pretended it was the TARDIS from Dr Who!